We are just a sucker for a good award show! The fashion, the Celeb’s, and so much more! We do believe that wedding gown trends also come from the runway and red carpets. So after every red carpet we like to choose our favorite dresses and ones that can be worn as a wedding gown in the right shade of white or ivory. Here are some of our favorite dresses. Cobalt Blue was a bright and powerful color this year that was on the red carpet. We are loving this color!! Could it be the newest trend for 2013 weddings? All three of these dresses could be gorgeous wedding gowns. Straight off the runway, this gorgeous Oscar de la Renta dress would make a gorgeous wedding gown in white. We also love this Monique Lhuillier that is also straight of the runway. We love this color orange as well. We’re not so crazy about the print but we love the flirty shape and style of this gown. We definitely see a s trend in wedding dresses with the one shoulder look. They are so glamorous and sleek. And are two favorite dresses are……..
We love this AMAZING Georges Hobeika gown that Juliann Hough wore. Stunning!! We hope you enjoy this adorable farm engagement shoot that was captured by Robert Holley Productions. These fun pictures were captured at the couples family farm in Virgina. We hope you get some great ideas and inspiration for your own Farm Engagement Shoot. Photography by: Robert Holley Productions. Every Thursday we find five things we love on ETSY! We hope you enjoy shopping and finding new amazing hand made items for your upcoming wedding. 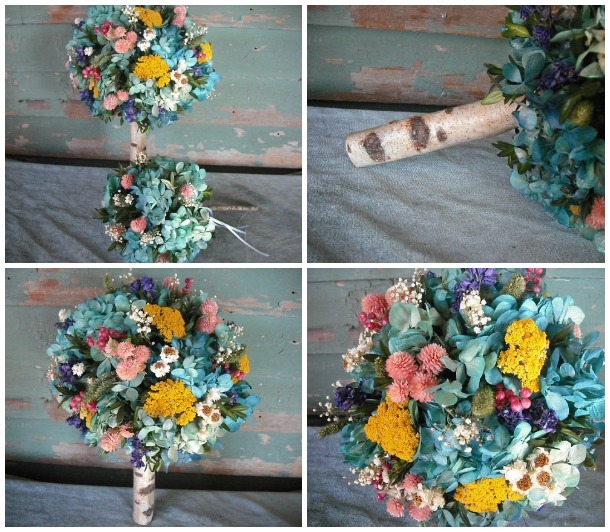 Dried Bridal Bouquet, perfect for a rustic wedding. We love the birch handle on it as well and it’s already dried so you can keep it for a while! $89.00 CLICK HERE to purchase. These adorable pine cone flowers are perfect for the rustic Tahoe wedding. Use in centerpieces, bouquets and so much more. These blinged out place card holders are perfect for any wedding and a great thing for guest to take home. Insert photo for a picture stand. $75 for 100 of them. CLICK HERE to buy. Mans best friend is his Dog! So why not buy an adorable custom bow tie for the groom with a matching one for your four legged friend. 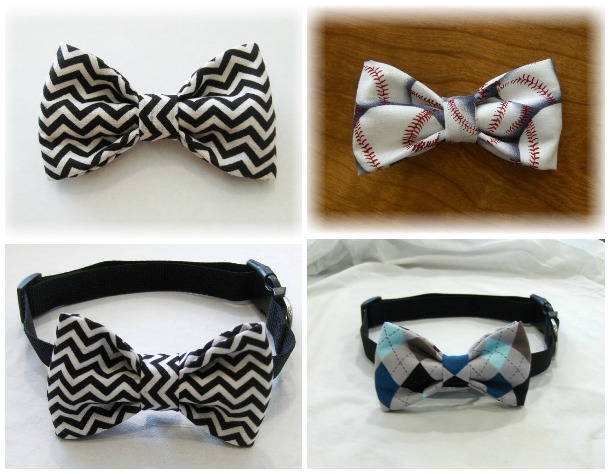 These store friend can create all kinds of cute bow ties for your groom, groomsmen, fathers or dog. A little rain didn’t stop Jennifer and Brad from shining bright on their wedding day! Round Hill Pines Beach in Zephyr Cover was showered with love, red roses and a little rain. Friends and family gathered beach front as the two exchanged their vows with one another. Handmade signs and DIY details offered well wishes and personal touches. After the ceremony, the celebration continues at a nearby vacation home in the stateline area of South Lake Tahoe. The photos were captured by Orange Blossom Photography. What are your plans for tomorrow night? It’s not to late to get your tickets for the WEDDINGS OF THE WORLD bridal show. Find lots of great vendors and receive a complimentary gift bag. Light up your wedding with some fun glow! 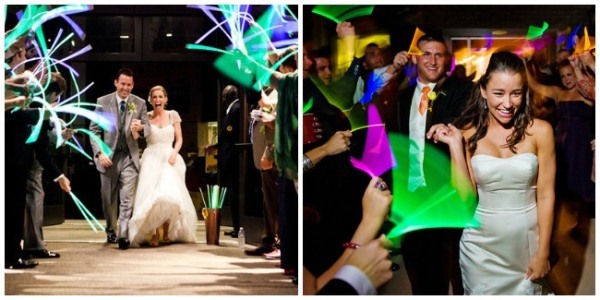 Glow sticks are a low cost way to add some fun to your wedding. Afraid of walking through sparklers at the end of the night. Let’s say a few guests have had a few to many to drink. Maybe giving them something on fire to wave at you is not the best idea. 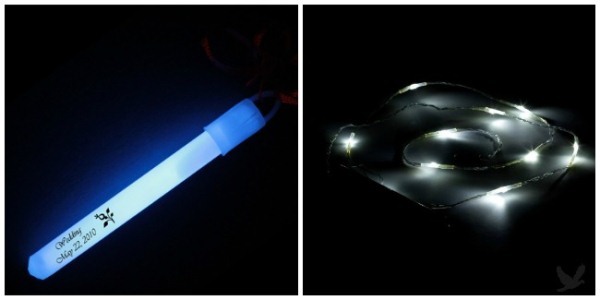 Get the same look with these long glow sticks. Need a way for guests to find your venue in the night. Stick a few glow sticks inside a balloon prior to filling with helium. They will be easy to see while driving and look great too. Looking for something to float in a pool but don’t want to spend a ton on flowers. 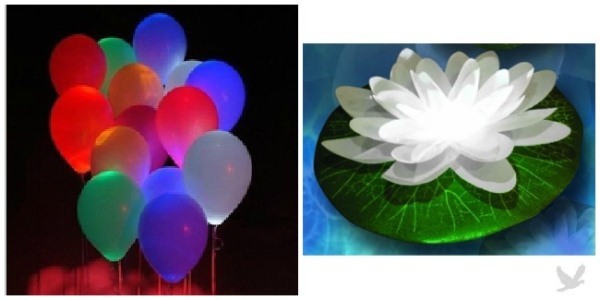 These lily pads light up and float. You can purchase 12 of them for $60. CLICK HERE. 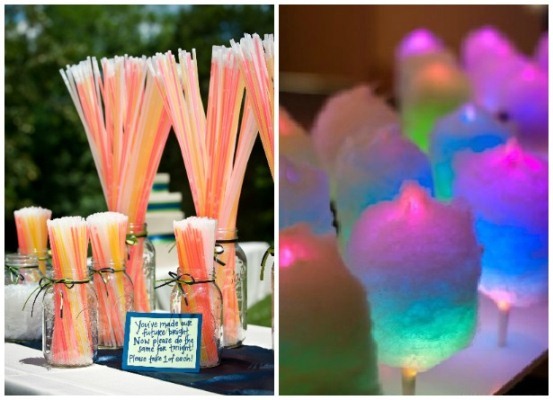 We love this cute glow stick station for a wedding. Everyone loves to wear a glow stick! We also love the idea of the glow sticks inside these fluffy cotton candy desserts. Perfect for a fun wedding. 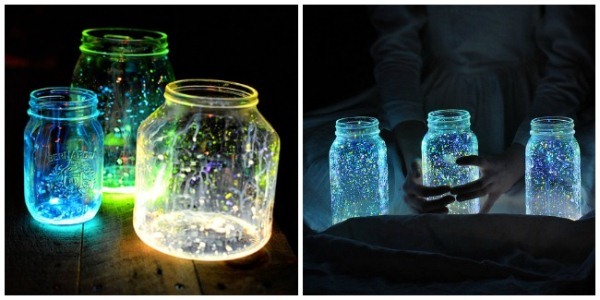 Cut open a slow stick and empty into a mason jar. Add some sparkly glitter and replace the lid. Shake the jar and there you go. Perfect for lighting pathways, centerpieces and so much more. You can find glow products in every shape and size. The possibilities are endless. They make customized glow sticks with your wedding date on it. we also love these cordless lights that are prefect to put in a centerpiece or other products to create that glow. Not battery needed and you don’t have to plug them in. Only $8 CLICK HERE. We are loving this unique styled engagement shoot that was photographed by Wren Photography. “When we were asked to photograph Holly & Dano’s engagement session, we knew in an instant that we had to do something beyond special because Holly is an amazing photographer in the area. My team and I hauled a piano into the woods of Marquette, MI and began to work our magic setting up a beautiful stylized engagement session. We created the paper accessories and colored vases to add to the great set up by Live Life Events.” explained Jennifer Tucker of Wren Photography. Make sure to also check out the adorable video that Geoffrey Kartes Films captured during the shoot. What a great idea to have your videographer join you for your engagement pictures to have you tell the story of how you met. We love it all and we hope you do too. Picture a colorful garden where roses perfume the air and acres of vineyards stretch toward a glorious sunset. Tiny lights outline a grape-stake fence beside a lush lawn. And, in the midst of the garden, a wedding gazebo waits just for you. Now picture yourself saying, “I do,” to the love of your life! At Wilson Vineyards they supply everything in this romantic setting–except the love of your life. They only do one wedding a day so the venue is all yours. The rustic charm of the barn is so adorable and unique. The property is family owned and we just love to work with Sandy Wilson. You can choose a caterer of your choice. They have the best Almond Champagne on the market! It’s so tasty. They have several different wedding packages to meet every couples needs. You get to take pictures with a vintage truck they have on property. You get the out door wedding that you want but the security of having the barn there just in case of weather. Did we mention they have fabulous Champagne! It’s our favorite! To plan your wedding or event at Wilson Vineyards please go to www.wilsonvineyards.com. Tell them you saw them on Engaged Now What? Every Thursday we post 5 new things we found on ETSY that we just LOVE! We have to share with you our new finds. We hope you enjoy. Blast off. 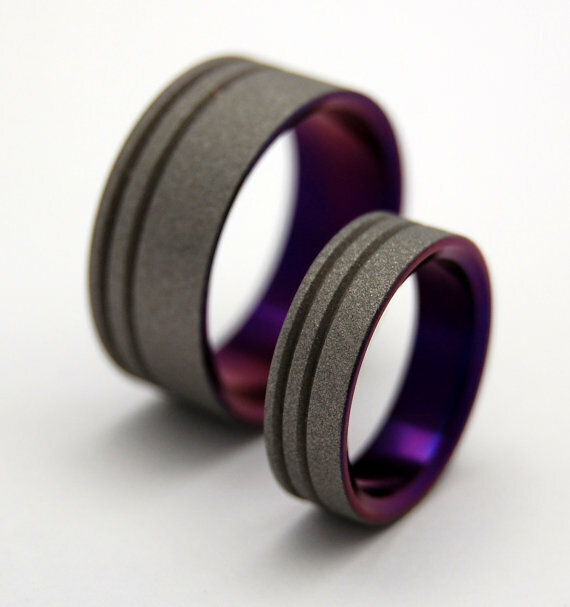 A sandblasted finish and anodized purple interior add a whole new dimension to this Double Offset Pinstripe band. $275.00 CLICK HERE To purchase. This headband is vintage inspired and very eye-catching with pleated detailing, pearl bead swags and ostrich feather. These make great groomsmen gifts for your guys. 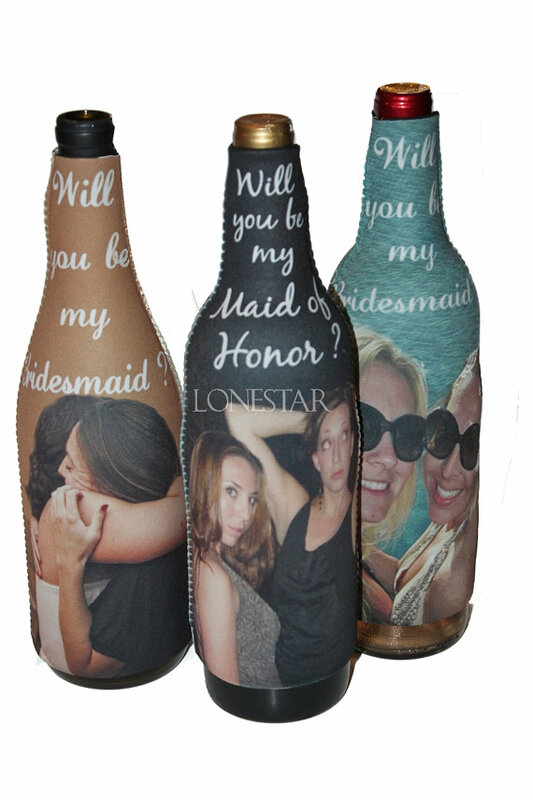 We are loving these wine insulators that are personalized with a picture of you and your bridesmaid. A perfect gift to give with a bottle of wine. We are excited to share this adorable engagement shoot that was captured by Carmen Salazar Photography and styled by Fearon May Events. “We did three styled shoots for this couple that took place in Clarksburg. The first shoot was a picnic seen and vineyard photos that we took at Wilson Vineyards. The second set we took on a dirt road where we incorporated bright red round carpets from Ikea along with large over sized balloons. The couple also wanted to incorporate their larger then life pooch into the shot as well. We then drove down the road to the yellow bridge that has a beach area where we took some pictures on the sandy shore. Clarksburg is an amazing area for engagement pictures!” says Fearon DeWeese of Fearon May Events. We hope these pictures inspire you to bring some cool props to your engagement shoot or hire a planner to help you style it. Thanks again to Carmen Salazar Photography for sharing. Today we remember those that we lost on September 11th, 2001 and those that are still fighting over seas for our countries freedom. Our thoughts and prayers are with you. Today we bring you the all American backyard wedding. This was a fabulous, totally DIY family event. The couple was married on family property in the beautiful hills near San Luis Obispo CA. The event was rustic and casual with numerous personal details. We have never seen a wedding where the bride and groom together are the officiant. They read from a book and said their vows to each other. They had a cute sign that asked guests to help announce “you may now kiss the bride” at the end of the ceremony. Everything for this wedding was made from love and family members. It’s ALIVE! 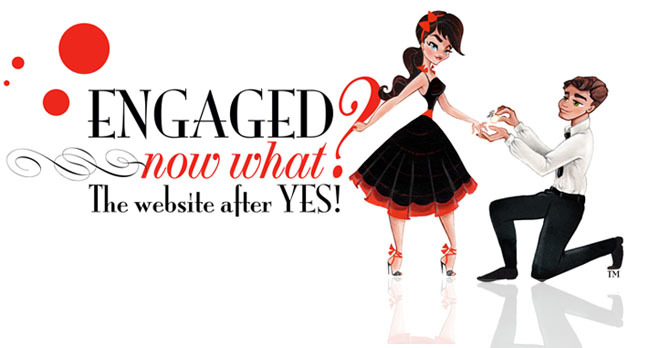 The New Engaged Now What? That’s right we are feeling so good about our new website! It’s faster, more stylish, easier on the eye, did I mention so much more faster!! We are also now very well protected for spam and viruses. We appreciate all your support while we iron out all the kinks and get everything perfect. You can now visually see our website on Internet Explorer which is great because we want everyone to be able to see it the same. On the bottom right hand corner of the screen you have a little arrow that will take you to the top of the screen super fast. We have a lot of ways for you to pin, facebook, tweet anything and everything on our website. As you browse through everything, if you see something you like just click away on the social icons under each venue, wedding binder or blog. It’s that simple!! Check out our inspiration boards! You can click on any picture to start a slide show for each category. Feel free to start pinning away to add the picture to your own Pinterest boards. We have also moved over everyone that was registered with our old site to the new one. If your saved information to your Wedding Binder did not get transferred we would like to apologize. We tried to make it as easy as possible for you but we lost somethings in the transaction. 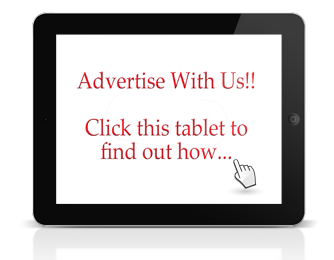 We hope you enjoy all the perks to the website and enjoy using it to help you plan your next wedding or event. We put a lot of hard work and time into creating something that is user friendly and fun for everyone to use. If you see something out of place or not working right please let us know. There is a lot of website to cover and we’re human so there are bound to be a few things we miss. This fun engagement shoot was captured at an adorable park. If your looking for a playful setting then a park is the perfect place to bring your inner child out. These fun pictures were captured by Leona Marlene Photography. Thanks so much for sharing. Photographed by Leona Marlene Photography. Brides are constantly looking to be unique and different. We’ve seen birdcage veils, feathers, petticoats, etc. Whatever the style, it seems to catch on real quick and become a trend in no time. Here is an item we have not seen…bridal gloves. It gives any bride that 80s chic inspiration, while looking classy and glamorous! This cake topper is sparkly, elegant and unique. The font is amazing and would make a simple cake or an extravegant cake look one-of-a-kind. We can never get enough of easy and reasonably priced bridesmaid dresses. This looks like it can go on anyone and go any way and look fabulous. This dress is unique because it is NOT one size fits all. Who really believes that a dress should be one size fits all. Face it, we aren’t all the same size. You can order this dress in your size and what color you want and decide which stylye looks best on you. And who can beat $70 for a bridesmaid dress? Every wedding has at least one person who they have lost and cannot be with them to share their special day. A grandmother, father, friend… These cufflinks are the perfect gift or purchase to wear that will make you and everyone around you feel that special person is there in spirit. Do we even need to explain these? They are just plain adorable. Wear these on your bachelorette party and turn heads. Since bridesmaids dresses are starting to take a more simple look we are seeing a huge trend in printed shoes. Bridesmaids dresses in the past use to be these huge ball gowns that were uncomfortable and something you would never wear again. Now they are short simple and something you really can wear again. Most dresses are a solid print, so how cute would it be to dress it up with a fun printed shoe? We are seeing everything from floral prints, to leopard print and even hand painted shoes. The options are endless. These celebs rocked the leopard print shoes with cute dresses. You have your bridesmaids all wear the same shoe or if they all have different body types that don’t always do good in heels you can allow them to find their own leopard print shoes. The mixed matched prints still look great together. Thank God it’s Friday. Since I’m sure you have had a busy week planning your wedding, take tonight to relax with your fiance’ or have fun with some girlfriends and enjoy this CLASSIC! Don’t forget: Each week we will be posting a new Movie, Cocktail & Meal for you to enjoy with your fiance’, friends or just for a night to yourself. Leave the planning to us! A musical about teens in love in the 50’s! It’s California, 1959 and greaser Danny Zuko and Australian Sandy Olsson are in love. They spend time at the beach, but when they go back to school, what either of them don’t know is that they both now attend Rydell High. Danny’s the leader of the T-Birds, a group of black-jacket greasers while Sandy hangs with the Pink Ladies, a group of pink-wearing girls led by Rizzo. When they clash at Rydell’s first pep rally, Danny isn’t the same Danny at the beach. They try to be like each other so they can be together. Thank God it’s Friday. Since I’m sure you have had a busy week planning your wedding, take tonight to relax with your fiance’ or have fun with some girlfriends and enjoy this CLASSIC! Who can resist a young Patrick Swayze? In the 1960s, Frances “Baby” Houseman, a sweet daddy’s girl, goes with her family to a resort in upstate New York’s Catskill Mountains. Baby has grown up in privileged surroundings and all expect her to go on to college, join the Peace Corps and save the world before marrying a doctor, just like her father. Unexpectedly, Baby becomes infatuated with the camp’s dance instructor, Johnny, a man whose background is vastly different from her own. Baby lies to her father to get money to pay for an illegal abortion for Johnny’s dance partner. She then fills in as Johnny’s dance partner and it is as he is teaching her the dance routine that they fall in love. It all comes apart when Johnny’s friend falls seriously ill after her abortion and Baby gets her father, who saves the girl’s life. He then learns what Baby has been up to, who with and worse – that he funded the illegal abortion. He bans his daughter from any further association with “those people”. In the first deliberately willful action of her life, Baby later sneaks out to see Johnny – ostensibly to apologize for her father’s rudeness – and ends up consummating her relationship with Johnny. A jealous fellow vacationer sees Baby sneaking out of Johnny’s bungalow the next morning and in an act of retribution, tells management that he is responsible for a theft the evening before, knowing he would not furnish his real whereabouts. Having trouble seeing the font? You’re probably using an older version of Internet Explorer. Upgrade to Mozilla Firefox by clicking here. It’s free! If you’re seeing the font…enjoy! This is a framed 3D paper tree with detailed hanging hearts. You can have it made to say your vows, your first dance song, a love story, your wedding guests…the options are endless and you will love and keep this gift for years to come! 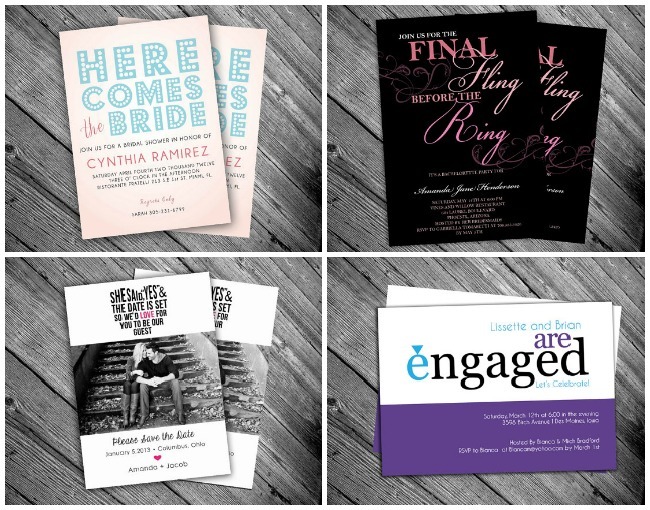 What better way to seal your wedding invitations or make a sticker for your candy bar or sign your thank you notes? This is a stamp that is cheap and convenient and a must have for any bride and grooms. We have posted these bottle openers before, but it has been awhile and we just think they are the coolest groomsmen gifts ever. Forget about flasks…they’ve been done. This bottle opener will be cherrished forever and can be customized to show any name or saying requested. This vintage inspired stunning hair comb is an elegant addition to any wedding hair style. It can even be added to any veil. Bling! Bling! This sign would be the perfect addition to any table at your ceremony: the cake table, the gift table, the guestbook table. It can also be used as a prop for picture taking. In addition, who wouldn’t love to place this on their mantle when returning home from your special day? It comes in many colors to match your wedding colors or colors in your home. We have talked about over sized balloons before but wanted to showcase them today as the Trend for Trend Setting Tuesday. We are seeing more and more people use them for so many unique ideas. One creative idea we love is having each bridesmaid and groomsmen walk down the aisle holding one. This also makes for great pictures and added color when the bridal party is standing at the altar. Covering a ceiling with balloons or creating your own ceiling using just balloons can be cute and more affordable then draping. Tying large balloons to a small centerpiece can make a big impact in the room with out a big cost. The sky’s the limit for ideas with these large balloons. And for some reason these over sized 36″ balloons just seem so much more classier and a whole lot more fun then smaller ones. Photo’s by Carmen Salazar Photography, Styled by Fearon May Events. If your looking to purchase some large balloons for your wedding or engagement shoot we suggest purchasing them on www.shopsweetlulu.com for $5.00 a piece. They come in all kinds of colors. You can also buy a value back that comes with 6 assorted colored balloon for $11.99 at Party City. Yellow and Grey have been some of the most popular wedding colors of the season and can mesh with almost any wedding style. Today we bring you a fantastic use of these modern and cheerful color scheme captured by Still Memories Photography. We especially love the way the colors compliment the rustic chic feel and adorably country venue. This couple paid special attention to detail which seemed to have definitely paid off. We hope you can gather some inspiration from this real wedding to use for your big day!